An action packed shooter where you must defend 3 hapless civilians from the relentless onslaught of nasty villainous types. 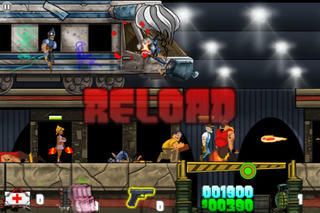 Collect cash to upgrade your arsenal of weapons including pistols, shotguns, machine guns and sniper rifles. Two control modes (touch or tilt), and two difficulty levels (easy and hard). Includes OpenFeint providing 4 online leader-boards, achievement, chat rooms, friends tracking, Facebook and Twitter integration. Select easy or hard difficulty mode. Easy has less enemies and requires less hits to kill. You'll want to upgrade your guns somewhat before attempting hard mode. Select the control mode. Touch mode is simplest and most popular. Merely touch where you want to shoot. In Scope mode, you tilt the iPhone/iPod to aim a reticule. Press the fire button located on the far right to fire your gun. On the Map screen you can select a mission to attempt, or select the shop to upgrade your weaponry with cash earned in game. Red areas are locked and you must complete the earlier missions in that game mode / difficulty to unlock the later missions. In game your job is to defend the civilians by killing all the enemies. Anything you destroy will drop cash, ammo, grenades, explosives or health packs. We integrate with OpenFeint online system. This includes posting any achievements to Twitter or Facebook, and we support leaderboards for each possible game mode. The score submitted to the leaderboard is the single aggregate of your scores for all of the 6 missions in that game mode. So in order to beat your current score, you just need to improve your score on any level.